The bestselling memoir by one of Australian most adored performers on stage & radio. 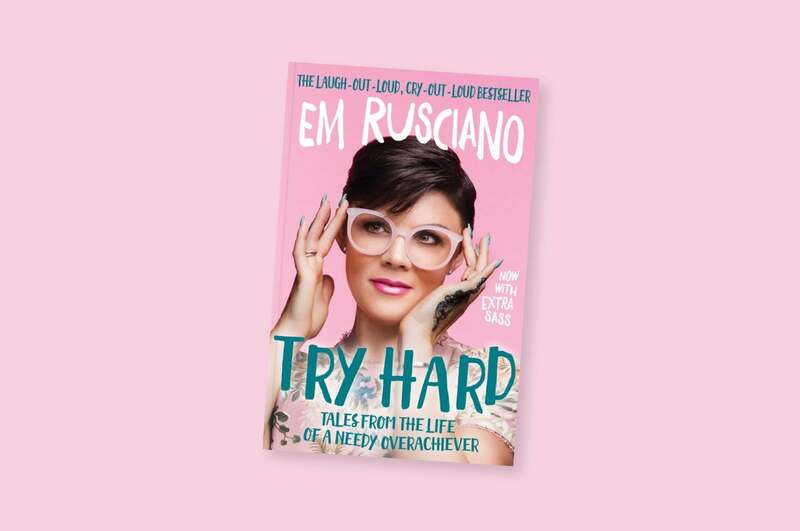 Funny and feisty, Em Rusciano’s insights into her world of mayhem, marriage and motherhood are laugh-out-loud, cry-out-loud balm for the soul. From her exploits at the Miss Sheila Fancypants School of Dance and her efforts to secure a solo at her end-ofyear performances, to embracing the spotlight as an Australian Iold contestant and her deep and abiding love for John Farnham, Em Rusciano is a self confessed bottomless pit of anxiety with a taste for glitter. And behind the stage make-up Em is an overachiever of epic proportions, camp to the core and fiercely maternal. She has all the insecurities of a person who spends their nights racked with self-doubt and all the confidence of a woman who can walk out onto a stage in front of a sold-out theatre and absolutely slay the crowd. Em has legions of loyal online fans and an army of gay men she adores, she tells the best dirty jokes and loves those closest to her ferociously. When the chips are down you definitely want her by your side. This all-singing, all-dancing, all-emoting, leopard-print clad warrior is fearless, fabulous and pants-wittingly funny. Her words on the page are silly and sacred, bawdy and heartfelt. The stuff of LIFE. 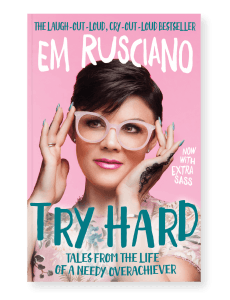 Try Hard is her story. Because she is. And she does. *Please note emrusciano.com online store will close 7th of December 2018. and will reopen 1st of February 2019. All orders made after the 7th of December will be processed in the new year.